There’s a deck of cards based on the people and images of the US Revolutionary War, and there seem to be some secrets hidden within. It’s like Christmas! Let’s start with some of the particulars of the box. Sealed with a sticker. A variation on the Anti-Stamp Act logos. Upon opening, we get a hidden “Liberty Or Death”, reference to Thomas Paine. Also, the side tabs present a snake and a lit fuse. The snake in this set of images probably doesn’t connote evil, but rather refers to Franklin’s Join Or Die image. Why Franklin chose a snake over any other animal which is dead when cut into pieces, I couldn’t say. The card backs present a mix of images related to the founding and icons of the Freemasons. The Masonic Square and Compass logo, as well as everyone’s favorite pyramid-topper The Eye of Providence are featured prominently. Now to the best part: the cards themselves. The general rule seems to have been to use famous figures for the kings and queens, and then more general roles as the Jacks. The King of Spades, with the crossing of the Delaware behind him, can only be Washington. The King of Hearts is Paul Revere on his midnight ride, ft. a lantern and the Old North Church. The King of Diamonds, backed with images similar to those in John Trumbull’s painting of the signing, I am assuming to be John Hancock. TJ’s hair is way too messy. The King of Clubs has some mystery to it. 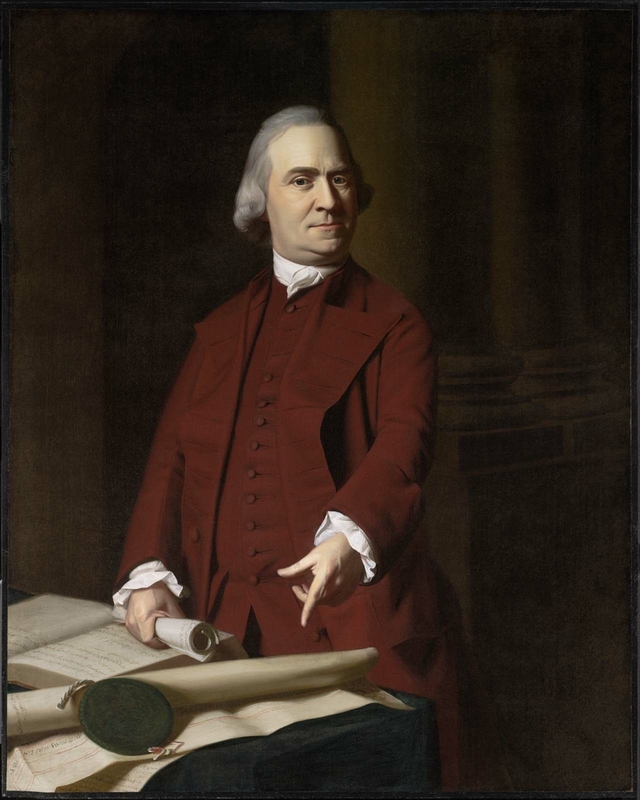 With the Tea Party in the background, I think we can safely say this is Samuel Adams. Especially when we compare to his non-beer portrait. (Thank you, MFA Boston). But what of the Masonic symbols in his hands? Why Adams and not the others? A quick googling returns citations of all of the other three kings as Masons, but not Adams. Or, in the broader sense of the imagery in the deck, are we to see Adams an an architect of the Revolution? 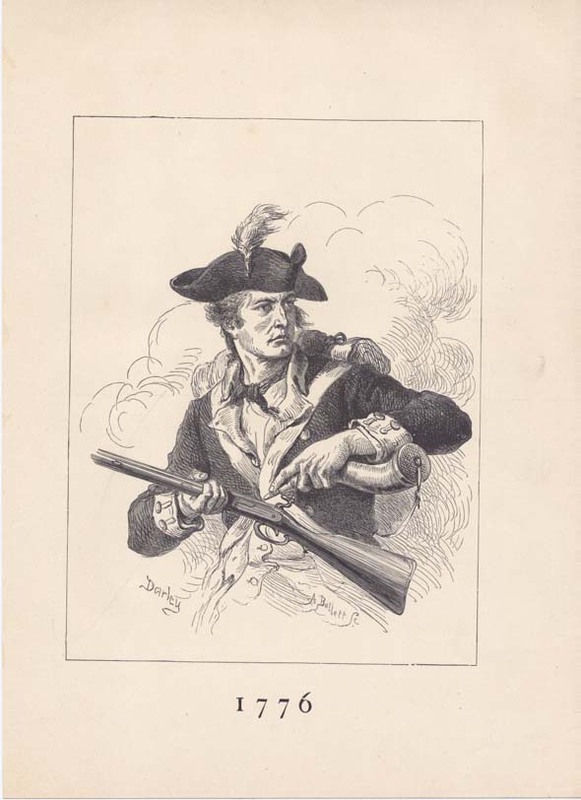 He was certainly active in the Sons of Liberty. MYSTERIES ABOUND. The Queen of Spades, loading a cannon under enemy fire, is folk hero Molly Pitcher. I had never heard of Pitcher until I started looking into this deck, and I have yet to forgive my Social Studies teachers. Now here’s something notable; the scrollwork on her clothes has two snake-heads (just at her collar). There’s scrolly goodness on all these cards — why are we just seeing the snakes now? Hmmm…. The Queen of Hearts is Betsy Ross. Note the inclusion of the queenly flower. The Queen of Clubs. Let me say the thing about my Social Studies teachers again. I mean, they were all fine folks and taught a bunch of great stuff. But I never heard tell of Nancy Hart, who got a bunch of enemy soldiers drunk and killed them with their own gun. Awesome. Head-scratchers. I don’t think they’re meant to be particular people, but I’m not sure. Jack of Spades. A naval captain. John Paul Jones? Jack of Hearts: A blacksmith, beating what we have to assume was once a ploughshare into a sword. Note the snake-head at his shoulder! What the heck’s going on with those? Jack of Diamonds: Ah the noble aspect of the patriot soldier. Jack of Clubs: a drummer. Not the one from the famous painting. The Ace of Spades, traditionally used for the company’s logo and other rad illustrations, features the Liberty Tree with 1776 above it. I thought it might be the Charter Oak, but the leaf shape seems elmier. And there’s our buddy the snake again, this time in a figure-eight knot. The Joker may be my favorite card in this deck. The stocks, symbol of abusive governmental punishments, now in disuse and growing ivy. And that’s that. If you have any clues on the images in this beautiful deck, please let me know! This entry was posted in Uncategorized on February 21, 2016 by gala5931.